Endeavoring to achieve social, economic, and environmental justice. We support the struggles of indigenous people to maintain their cultural integrity while interacting with the broader world. We recognize the destructive impact of unregulated extractive industries and support efforts by affected communities to take local control of the regulation of such industries and limit the impact of mining and drilling. We support those who seek systemic change in conditions that contribute to injustice and violence in the Americas and the Global South. We encourage awareness of our own role in perpetuating systems of exploitation and threats to human rights. We believe that we can learn from other cultures and value the lessons learned from our collaboration with our neighbors and allies. We conduct direct action through public protest and marches, and join in coalition with other organizations in the defense of human rights in Latin America and beyond. Over four decades of Solidarity, 1976 – 2018. DJPC was founded in late 1976 in response to the National Catholic Bishops’ Call to Action. DJPC expanded and incorporated in 1979, as an interfaith membership-based organization addressing global injustice in developing countries. 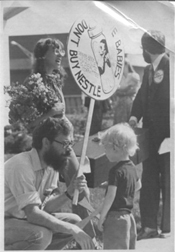 One of its first projects was participating in the international boycott of the Nestle Corporation for its unethical marketing of infant formula in the developing world (see photo). In 1984, DJPC supported a campaign against Western Airlines for its cooperation in the deportation of Salvadorans. Soon after that DJPC promoted a campaign to declare the City of Denver a sanctuary for Central American refugees. Through the rest of the decade and into the present, DJPC has continued to work in solidarity with the people of Latin America by sponsoring educational programs, lobbying elected officials, and promoting action campaigns. In 1996, when Guatemala signed the Peace Accords after years of genocide, DJPC began sponsorship of individuals called “accompaniers” whose witness protection with the Mayan people continues to this day, through the national organization called NISGUA.